The Barefoot family were born in the islands, this gives us a unique love and respect for the beauty and fragility of our natural environment and playground. St Vincent’s premier and longest-established bareboat yacht charter company, is owned and operated by the Barnard family who have been sailing the waters of the Grenadines for 7 generations. This background gives us the distinct and unusual advantage of insight and local knowledge that most charter companies, no matter how experienced, simply cannot offer. Barefoot Yacht Charters is not a large company. We don’t have a hundred yachts in our fleet (we’ve actually limited our bareboat fleet size to 25 yachts), we don’t have 60-page glossy brochures and you won’t see our full-page colour advertisements in all the yachting magazines. The fact is that most of our guests hear about us by word of mouth, or are repeat bareboat customers who have already sailed with us or are people who have been recommended to us by others. We insist on a highly personalized service – and many of our guests are surprised to discover that such a “small” bareboat yacht charters outfit offers facilities normally associated with so-called “premium companies” – on-site ocean-view suites, a waterfront restaurant and bar, gourmet customized provisioning service, private jeep rental, travel agency and villa rental service. Oh, and by the way – no, we don’t have a chase boat – we have 9 aircraft (so much quicker to respond to our guests’ needs in the event that they have a problem down island). 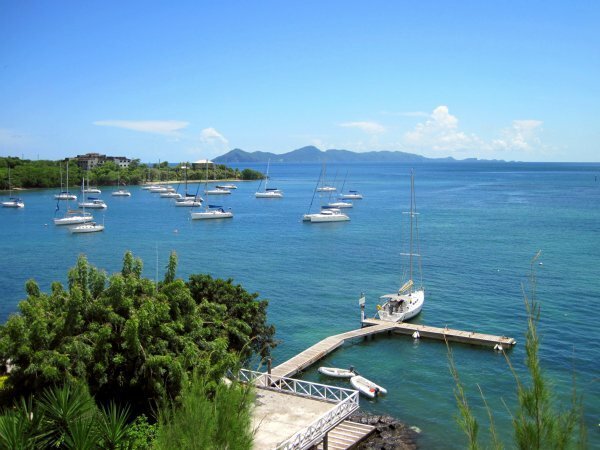 Our full-service marina, just a 15-minute drive from St Vincent’s airport, is at Blue Lagoon, the best protected harbour on St Vincent’s south coast. Bequia, northernmost of the Grenadines, is just 7 miles over the water and the islands of Battowia, Baliceaux and Mustique are visible from the surrounding hills. The Barefoot Group were born in the islands and this gives us a unique love and respect for the beauty and fragility of our natural environment and playground. We are sailors first, and as such, we choose to protect the oceans, seas and islands that make up our paradise but also to educate and thus help bring meaningful change to our planet. Barefoot yacht charters was a fabulous experience for our whole family. They were thorough in their prep before our trip and Mark provided us with a full itinerary that filled our family with a lifetime of wonderful memories to hold on to. While on our trip we had a phone and called in many times to get info and Tessa, Mark and staff assisted us promptly. When we returned to st Vincent, the staff were phenomenal in getting us docked. And we took advantage of their accommodations to decompress before we headed home! Thank you! Thanks again and we will definitely be in contact in the future! St Vincent’s new international airport opened in February 2017. We are up-dating this section regularly to let you know which airlines will be flying here. The flights will recommence just in time for the 39th annual Independence Day in St. Vincent (October 27). This is the second year the airline has offered direct flights after the opening of the Argyle International Airport in February 2017. If you cannot acquire direct flights, such as in the off season, most guests arrive by international flight landing in Barbados, and then take an inter-island connection (about 40 minutes) to St Vincent. LIAT, the regional airline, runs several scheduled connections each day, as does our own airline, SVG Air . LIAT also offers daily flights from St Lucia, Grenada and San Juan, Puerto Rico to St Vincent. If you’ve notified us of your flight details and arrival time, we will be happy to send a taxi to meet you at St Vincent’s E.T.Joshua Airport. 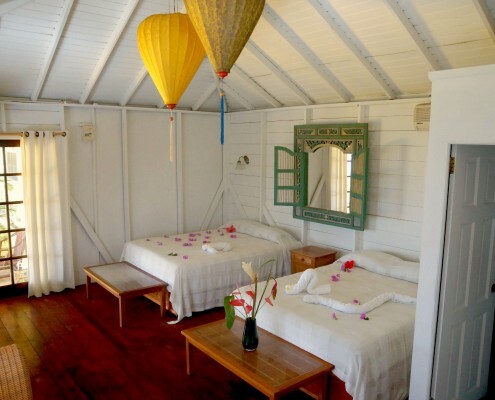 For those who prefer to spend the first night ashore, we recommend one of our lovely on-site rooms with views of the Caribbean and Atlantic complete with air-conditioning, cable TV, private bathroom and Wi-Fi. For those of you that would prefer to stay on the yacht you have chartered, first night Sleep Aboard are available at 1/2 the daily rate of your yacht. Upon your arrival, one of our staff will be waiting at the marina to settle you aboard the yacht. Once you’ve stowed your gear, please come up to Driftwood, our lovely Mediterranean restaurant and lounge bar. Breakfast is available at our restaurant which opens at 7.00 a.m. so dinghy in and enjoy breakfast on our deck with stunning views across the Bequia Channel. For more information or to book a sleep aboard kindly contact one of our booking agents .